If someone puts in a support ticket saying they are having DNS issues with your server, what do you do to quantify how your server is acting…? This is the “boat” I found myself in a while back. I decided to use cacti to poll my devices. I happen to run Bind9. I built off of a handy template I found on the Cacti forums. Though I did end up modifying it quite a bit. You can grab my version here: [Download not found]. You can follow the Template steps, but I’ve got some tweaks specific for my Centos CactiEZ install. Allow your new string to view more of the snmp tree. Be sure to set the SNMPD service to start on boot. Edit your linux firewall to allow your cacti machine to access UDP port 161 on the DNS server. Create the folder /var/cache/bind and make it writable. From the CLI issue “rndc stats”. Rename /etc/rndc.conf to anything else. Edit named.conf and comment out the controls section. Restart bind “service named restart”. Copy the dnsstats.pl and runstats.sh files to the /root/bin folder and ensure they are executable. Add the modified bind-stats.sh file(ensure it is executable) to the scripts folder. Import your cacti xml file. That was a BINGO for me! 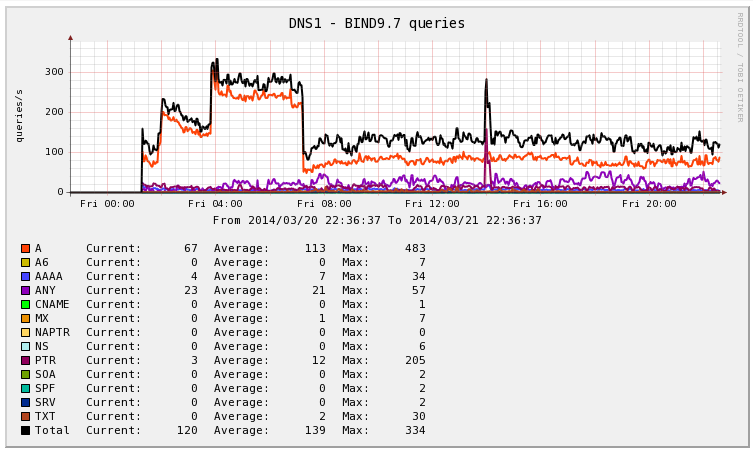 I’m in a great need for monitoring DNS’s, and also to find a way generating stats. What I was thinking for the stats that how can we have stats on hits per domain/IP? if possible..